Large - 19" L x 12" W x 7"
What is Snoozer Console Pet Car Seat? The Snoozer Console Pet Car Seat fits right on the console of your vehicle between you and your passenger. It keeps your pet safe, and out of your lap, but still right in the middle of the excitement! The interior of the Snoozer Console Pet Car Seat is equipped with a safety strap so your pet won't jump out, and an outer strap to secure the car seat base to your console's lid. It comes in small and large sizes, and three different color options. The Snoozer Console Pet Car Seat straps to the console lid of your vehicle, which keeps your pet out of your lap, for a much safer journey. It is made out of a firm, but comfortable foam that fits a larger console. The outer safety strap keeps the car seat in place, while the interior safety strap clips right onto your pet's harness to keep him or her from jumping out. The cover is removable, washable and dryable and comes in 3 different colors. Choose between either a small or large for your pet (See Size tab for details). For animal use only. Do not leave your pet unattended in a vehicle for an extended period of time. Measure your console and your pet before purchase. 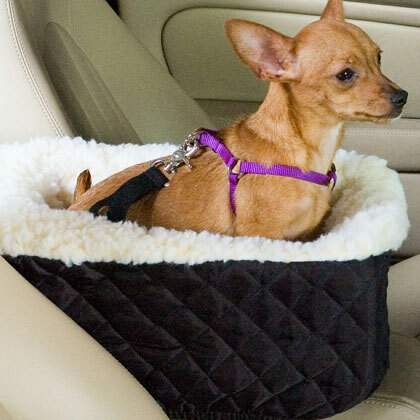 Place the Snoozer Console Pet Car Seat on your vehicle's console. Take the two outer straps and attach them underneath the opening of the console (between the lid and the bottom of your console). Once secured, place your pet inside the car seat and attach the interior clip to your pet's harness. At first, allow your pet to get used to his or her new car seat by taking short trips; gradually working your way up to longer distances. Try using a treat or catnip as a way to show your pet his or her new car seat.